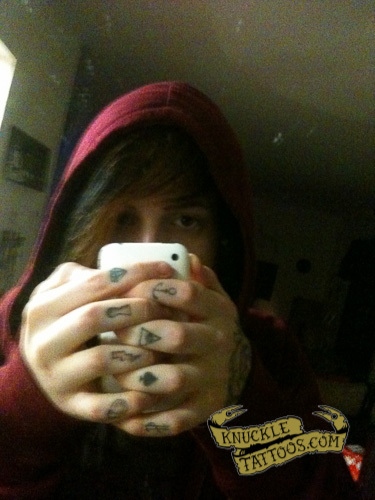 this is my new knuckle tattoo, it´s homemade and rockin’! It doesn´t mean anything. AWESOME! Oddvar Telstad sent these knuckles in a long time ago (twice) and somehow they fell through the cracks. Sorry about that Oddvar! Here they are now! The lightning is fram tha AC/DC logo. The cross is the Cross of Infinity, for the infinite love for my girlfriend. The spade is for luck. My name is Andrea Bailey. I’m 22 and my knuckle tattoos were the 16th piece I’ve acquired. 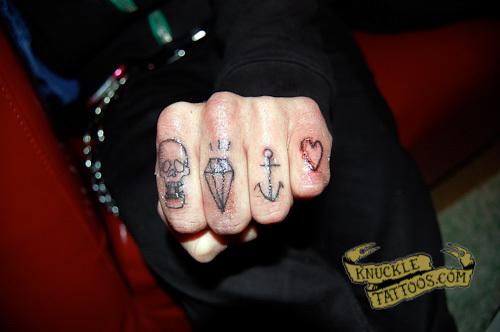 I Got my knuckle tattoos in Portland Oregon at a shop call SeaTramp. So he pulled out the Bible and we found the scripture. I then knew I wanted the symbols (eyes, teeth) when necessary. He decided to use the same font from the Bible for the lettering.